It might be summer, but I’m in the mood for comfort food. The theme of this week’s Summer Fest is peas, but when I started brainstorming ideas for a fresh and summery recipe involving peas, I kept coming back to comfort food. 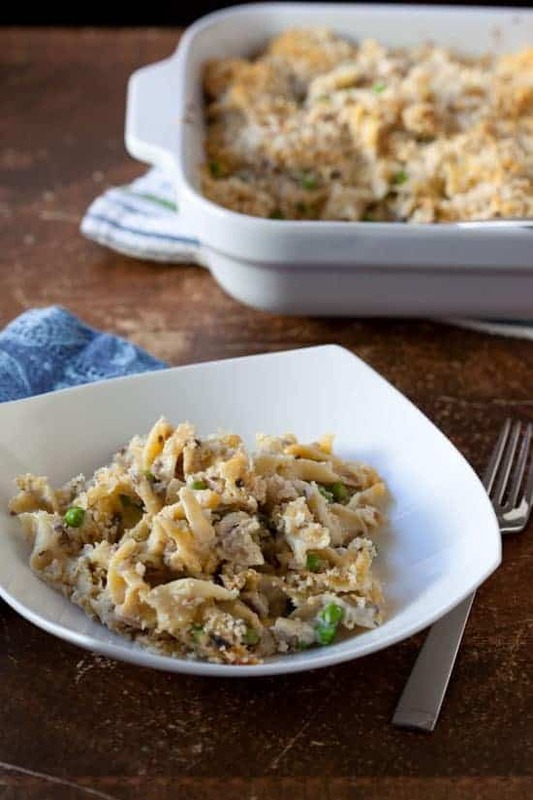 It might have been the cloudy weather we had earlier in the week or it might have been the terrible, no good day I had yesterday, but when I thought of peas there were only two ways I wanted to eat them—in a tuna casserole or with turkey, mashed potatoes and gravy. I opted for the casserole, which is serious comfort food for me. The thing about tuna noodle casserole is that I have this idea in my head about what it should taste like, but when I actually make the casserole using my mom’s recipe, I’m always at least a little bit disappointed. Yes, it tastes familiar and I’m instantly transported back to my childhood, but my grown-up taste buds realize that it’s really not that great. So I decided to remake this childhood classic to try to make it taste as good to me now as my mom’s casserole tasted to me when I was a kid. I didn’t change much because I really do want it to be the same casserole. I just needed to get rid of that can of cream of mushroom soup and add a bit more flavor. I did this by sauteing some finely chopped onions, mushrooms, and celery in butter until the vegetables started to caramelize a bit and used that as a base for the sauce. I also threw in some thyme to add just a little extra boost. The results were just what I wanted. It looks like my mom’s tuna noodle casserole, it smells like my mom’s tuna noodle casserole, and this one tastes just as good to me today as my mom’s casserole tasted then. This is a homemade tuna noodle casserole that should satisfy both kids and adults! Preheat oven to 375 degrees and grease a 13x9-inch baking dish. Cook egg noodles in a large pot of salted boiling water until almost tender; drain, rinse briefly under cold water, and return to pot off the heat. Meanwhile, heat milk in microwave or on the stove just until warm then set aside off the heat. Heat 4 tablespoons of butter in a large skillet over medium heat and cook onions, mushrooms, and celery with a generous pinch of salt until all the water from the mushrooms has evaporated and the mixture is starting to brown and smell really great, about 12-15 minutes. Stir in the thyme and cook for a few seconds until fragrant and then stir in the flour and cook, stirring constantly, for about a minute (mixture will be quite dry - that's okay). Turn up heat to medium-high and pour milk into the flour mixture, whisking to break up any clumps. Stir constantly until sauce is thickened and bubbly. Turn off heat and season well with salt and black pepper to taste. Add sauce to the noodles in the pot along with the peas and tuna. Stir everything together well and at the very end stir in the shredded cheddar cheese. Pour the mixture into the greased baking dish. Melt remaining three tablespoons of butter and toss with the breadcrumbs. 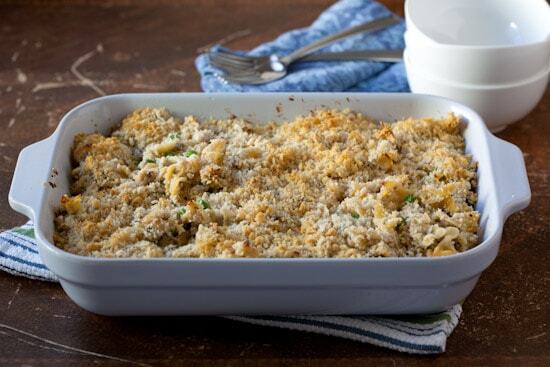 Sprinkle buttered crumbs over the top of the casserole. Bake at 375 degrees for 25-30 minutes or until the bread crumbs are evenly browned and filling is bubbly. Let sit for 5-10 minutes before serving. I love tuna noodle casserole. This sounds fabulous! That is comfort in a dish, and I love that you made it with fresh mushrooms. I'll never tire of good ole tuna noodle casserole. I made a homemade version last year and it was the best ever. Yours looks delicious. I wish I had some! wow this looks and sounds great! I like very much homemade tuna noodle casserole without canned soup.and this article is very helpful for this recipe. I'm going to try this tomorrow night after work - 8 people to please, and if they all give it a thumbs-up I'll whack it onto my favorites list right away!! that sounds great..i'll introduce this to my cousin maybe she loves this..hehehe.. I grew up on Tuna Casserole so I have to admit this is one of those guilty pleasures I still totally enjoy!! Turned out perfect! Used Parm instead of chedder, and added dill for seasoning. Great recipe. I used 1 lb of fresh crab meat instead of tuna (because I had a ton of it), and it was delicious. The sauce is perfect! Thanks for this.. I was in a pinch tonight not having made it to the store for groceries as planned.. looked in the cupboard and found 1 can of tuna, about 10 oz of elbow pasta, and little bit of all purpose baking mix. I did a search for tuna casserole without condensed soup and your recipe came up. Thankfully I had a supply of cheese, butter, and milk, as well as some celery, 1/2 an onion, and 1 carrot, but alas no mushrooms! No problem! I minced all the veggies super fine and added 4 cloves of garlic to the saute. No peas but a handy supply of frozen green beans that did the trick. The thyme is a great addition, which I used at full strength of 1/4 tsp as called for. I will definitely make it with the mushrooms next time in a planned meal. Thank you for a great dinner tonight that even the kids loved. The buttered breadcrumbs are brilliant on top. Yum! However, I thought four cups of milk was overkill so I halved it...and still had PLENTY of liquid while keeping all the other ingredient proportions the same. I also made it gluten free with jovial noodles and gf all purpose flour. A keeper! Turned out great! Made this with chicken as I had it to use ( used 28 oz shredded) and had no Tuna. ;) Subbed Tarragon for Thyme-our taste-buds.. Also added 1 can chopped water chestnuts for crunch. Absolutely great! Will do the tuna version as written in the future. We tasted the sauce before adding cheese. My DH who Loves cheese on everything, said it didn't need it. I am sure it would be great with it, but we didn't want to cover the great flavor of the sauce!! Thank you! I love that this is made with milk instead of cream soups. I'm lactose intolerant and can make this with my special milk. I used low fat milk and it was delicious. I like that this casserole is made without canned soup, which allows me to control the sodium content. From now own it will be our Lenten Tuna Noodle Casserole! Thank you for sharing this recipe.